Who is that handsome young fellow? There are two Hereford-Worcester roads. Each one has a pub named The Wheatsheaf on it. These are facts. I know them. I did not know them before this day. And that’s what made us an hour and a half late as we roamed the Bromyard Downs in my mum’s little Peugot, with an unfeasible amount of equipment (and lard) in the back, at a unfeasibly early time on an unfeasibly cold Sunday morning, trying to find an unfeasibly unfindable farm. All of this time, Matt was sat in a very uncomfortable position in the rear right seat, or what would have been the rear right seat, had it not been folded down to fit more gear in, effectively encasing the unfortunate Mr. Hodges in a metal box constructed from grip equipment and plastic poles. And a piratical wheel. Sometimes, I suspect Matt may regret writing Cow Trek. Still, we got there in the end, and eventually filmed our first shot, with Mike (Farmer Blackbeard) having quickly learnt the intricacies of tractor operation. It was then that Julia Evans, head honcho of Longlands Farm, asked us exactly what we needed to film. 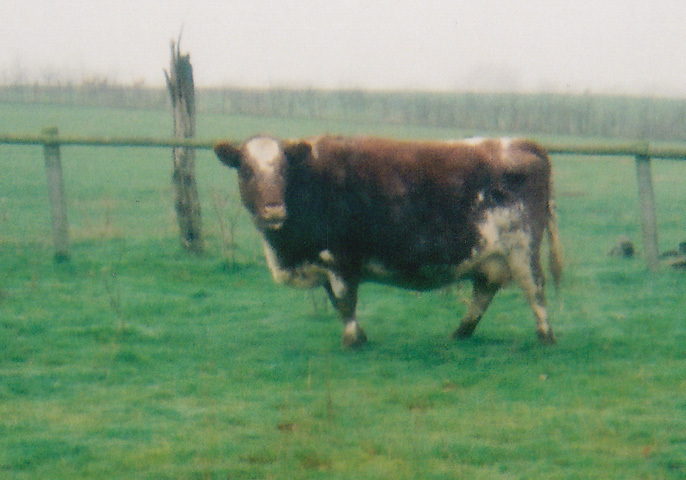 When I mentioned a cow in a field, she was very surprised. She had no idea. The cows were in barns. Fields would be tricky. Very tricky. It didn’t take long for me to start getting paranoid and shooting far too many takes and angles of everything, but we weren’t on a particularly tight schedule so it didn’t really matter. The first yard scene had that tacky low budget look with the two actors looking at a cow “that’s there, honest, but it’s just out of frame so you can’t see it”. Oh well. As the sun went down, we repaired to the farm’s study, where we promptly set up a whole bunch of lights in an attempt to make it look like day. Muchos comedy ensued as Mike improvised a sequence in which he swapped his hook hand for a biro appendage to sign his cheque, and then impaled it on the aforementioned appendage to hold it out to Farmer Giles. Having discovered, to my horror, that sound man David Abbott’s car had broken down, I was forced to get my mum to take us to the farm today. Arriving at the delightful time of 8:00am, we were kindly provided with a cup of tea by Julia, who then dutifully got two cows from the barn and put them in the paddock near the farmhouse. Sipping our tea gratefully, we watched Julia and her husband chasing one of the cows around, trying to get it into the field. We opted to make the other cow our star. As Matt had been saying for some time, the cow’s action consisted primarily of eating grass and walking along. This would not take all day, he insisted. Always the professional (read: know-it-all), I was more conservative. However, that cheeky bugger Matt turned out to completely right. Julia helped us out with the walking bits, shooing the cow up and down the lane. We were completely unable to get the beast to stand still next to Matt (a cutaway for the yard scene), but you can’t have everything. I was loath to broach the subject of bovine sexual congress with Julia, as she had been so helpful thusfar, despite having clearly not been briefed as fully as I had hoped on what we were going to need. An effect, I decided. It would be tricky, but what the hell? And at about midday, we realised we’d finished. Buggery. Mum wasn’t picking us up till 6:00pm. We killed the afternoon filming extra cow shots, recording sound effects and sitting around in the farm house. In the evening I went up to Chris Jenkins’ abode, for ’twas he that was providing a basement as a studio for the spaceship interiors. We had spent all of Saturday working on the set, but had progressed considerably less quickly, and considerably more expensively, than I had anticipated. Even the Hodges’ input on console construction had not brought us up to speed. But by the end of Monday night I was confident that we had done enough groundwork to allow Tuesday afternoon’s filming to start on time. 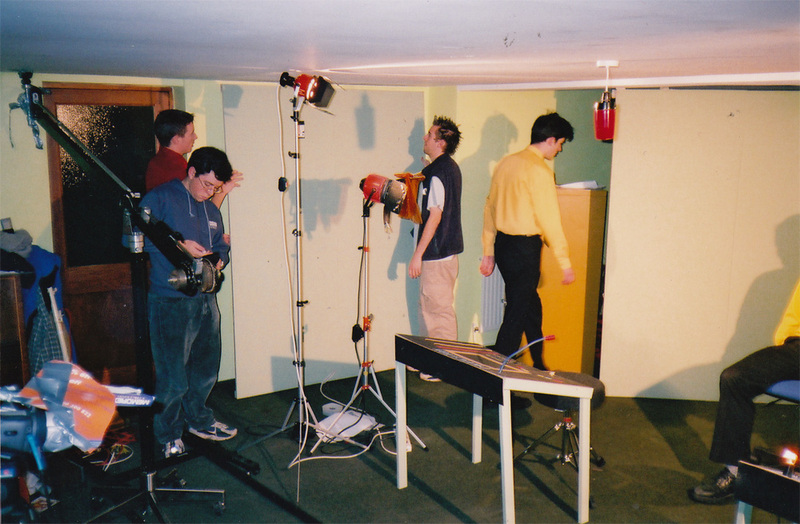 Actor Si Dovey (in red shirt) and I (in gillette, I regret to say) move a set panel into place while David Abbott adjusts the jib. Actor and composer Chris Jenkins, whose mother owned this basement, is in the yellow shirt. I can’t for the life of me remember what took us so long on Tuesday morning. We had been scheduled to finish the set between 10am and 2pm, then film the Engineering Room scenes until 5:30. In the end, we didn’t shoot a thing until 4:00pm. Late in the morning, I sent David out to get some gerbils. 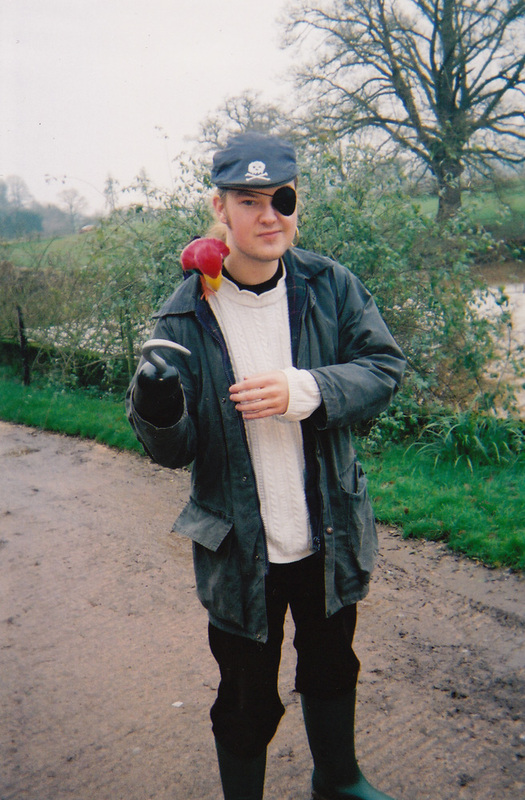 Directing him to the only pet shop I knew of in Malvern, with additional instructions to pick up some extra hardboard for the set, I was extremely pleased when he turned up an hour later with three hamsters. It was around this time that Chris’ sister Sarah became an inpromptu member of the crew, looking after the gerbils and making (occasionally) helpful comments as we affixed three plastic wheels to the fake walls and inserted rodents into them. Praise the Lord, the little blighters actually went round in them! Sadly we couldn’t get them all to go round at once, but I was happy enough. Finally Jim got to do some “acting”. 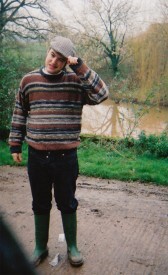 The script described Engineer McHaggis as “an overly Scottish man” who does “overly Scottish things”. Jim’s interpretation of the character, combined with the poor selection of Scottish items which were available to dress the set, is best described as “a barely Scottish man doing barely Scottish things”. Not only was he incapable of doing the accent, he also couldn’t deliver a long line, forcing me to cut the scene. 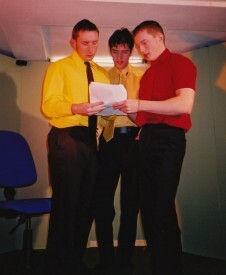 Lee Richardson (Captain Lightstar), Chris Jenkins (Ensign Lancer) and Si Dovery (Lieutenant Steeljaw) rehearse their lines. 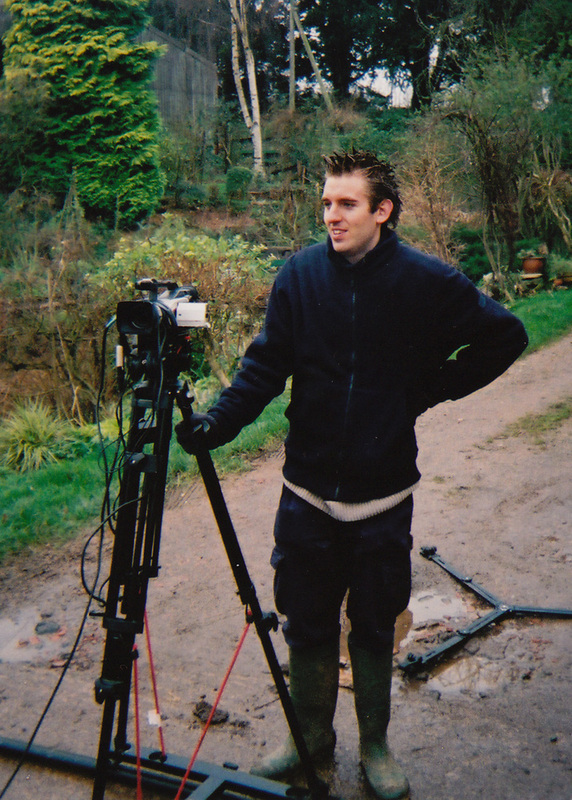 I don’t know at what point I realised that this day had about 50% of the film’s total running time scheduled to be shot on it, but I was brown-trousering when I did. However, I reasoned with myself, there were no animals today. Just lots of big dialogue scenes. But all in one location. Easy, right? Two and a half hours after our scheduled start time, we had finally constructed the sliding door for the bridge set and were ready to shoot. Once we got going, we rocketed through it. Again, loads of takes were needed – this time because my shotlist called for complex tracks/cranes combined with multiple focus pulls, and I kept arsing them up. I was annoyed when, about five scenes in, I had to rearrange my lovely lighting set-up in order to make way for an extra wall section. It never looked as good after that. Lee managed to get his arse out. A deliberate out-take – the sliding door opens and there are the hairy cheeks of the Tuxman’s posterior. Somehow we wrapped five minutes ahead of schedule, but there was then lots of clearing up to do. The mighty director was reduced to scrubbing the carpet, as it transpired that the dust sheets I had used whilst painting the set were of insufficient thickness, and the paint had seeped through to the carpet. I am told that those patches are now the only clean areas of the carpet.